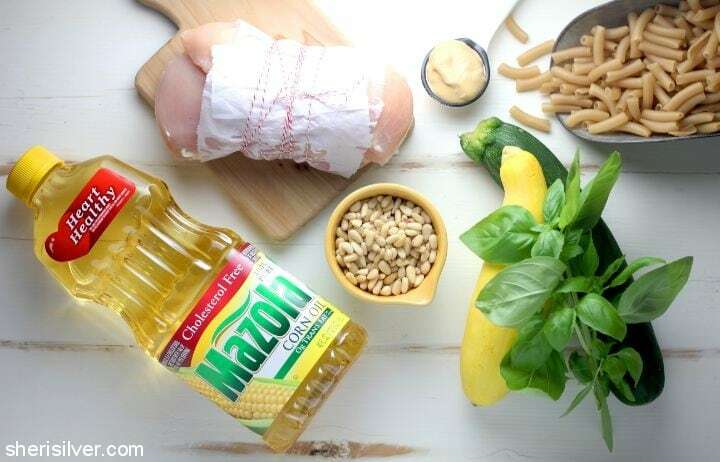 So excited to be partnering with Mazola® Corn Oil today! The challenge? 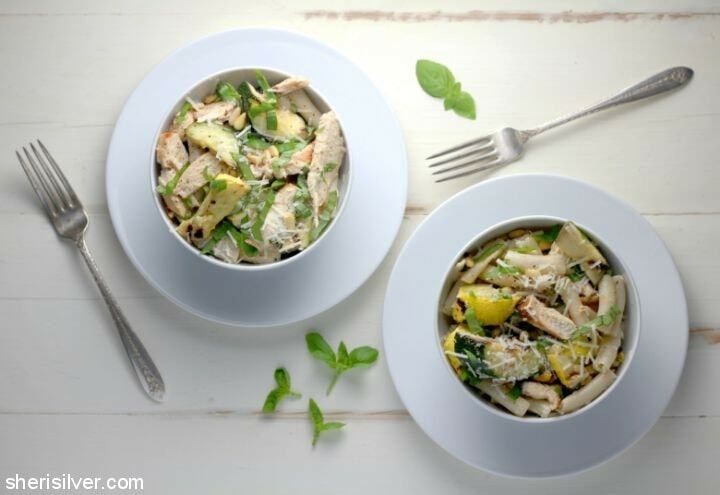 To take an easy weeknight dish – ready in under 30 minutes – and make 3 healthier “swaps”. One of the swaps included replacing the extra virgin olive oil in the recipe with Mazola Corn Oil. I was happy to do so when I read a clinical study showing that Mazola Corn Oil reduces cholesterol 2x more than extra virgin olive oil (to learn more about this claim, see Mazola.com). For this challenge I chose a dish that I’ve been making for years – pan-fried chicken and zucchini. A family favorite, but one that could use a lighter update, for sure. For my second swap I decided to grill instead of fry. This meant doubling the dressing, to have enough to brush on the chicken and zucchini prior to grilling. I knew Mazola would work because, as an all-purpose cooking oil, it’s as suitable for grilling as it is for mixing up in a marinade or dressing – with a neutral taste that lets the flavors of your other ingredients stand out. Mazola is also ideal for grilling as it has a smoke point higher than most cooking oils, at 450 degrees. And for my last “swap”, I replaced the white rice I typically serve with this dish with better-for-you quinoa pasta (brown rice pasta is another favorite). It’s gluten-free and high in protein, and holds its shape well when combined with other ingredients. It can be a real challenge to make delicious, kid-friendly (yet adult-approved) dinners that have visual appeal, are ready in under an hour, and are better-for-you too. But this dish so beautifully illustrates how – with just a few minor tweaks – it can be done. Making sure that every component COUNTS, and relying on ingredients that can do double-duty. For example, this 1-minute (promise!) marinade ALSO serves as the dressing. Done and done. And grilling – much like high-temp roasting – creates a beautiful finish and, in the case of the zucchini, a sweet, caramelized exterior that’s super flavorful. Finally, lots of fresh, seasonal herbs, crunchy pine nuts (because you will always win with crunch) and a sprinkling of the very best parmesan cheese (because CHEESE) tie it all together. This dish can be served warm or at room temperature, travels well (no more sad desk lunch! ), and doesn’t even require a knife! How do you make lighter, nutritious meals? Would love to hear your suggestions! 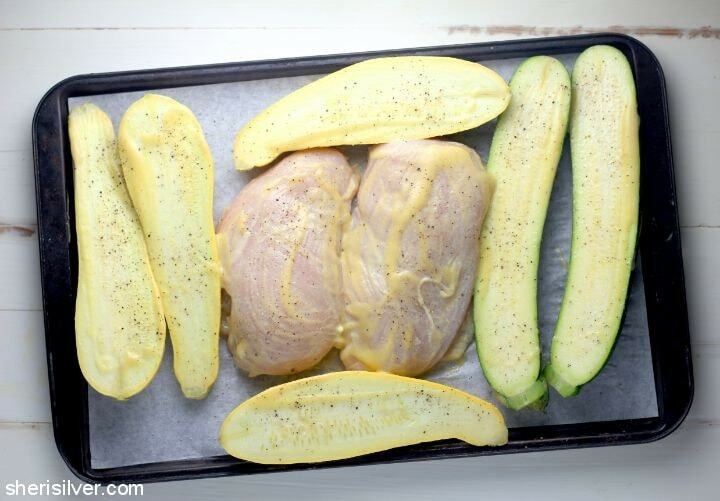 Pre-heat your grill to medium-high; place chicken and zucchini on a baking sheet. Whisk the mustard and vinegar till smooth. Continue to whisk, while adding the oil in a slow stream, till dressing is emulsified. Transfer half to a large serving bowl and set aside. 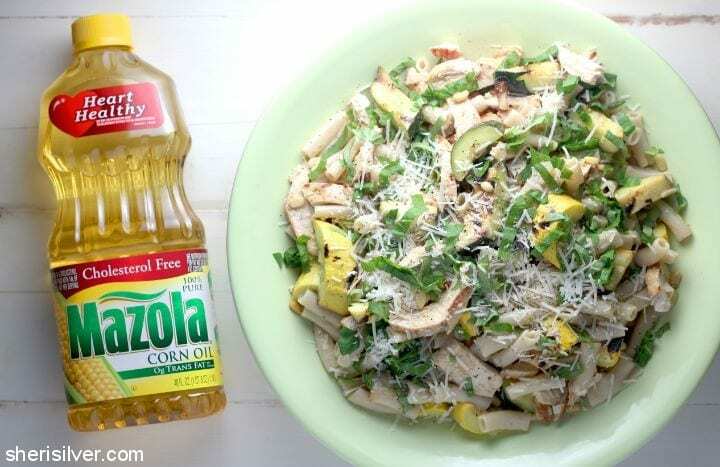 Brush both sides of the chicken and zucchini with the remaining dressing; season with salt and pepper. 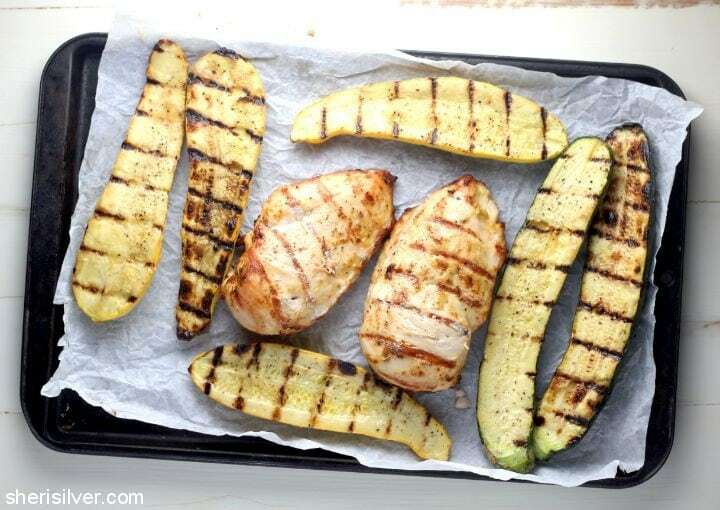 Grill till chicken is cooked through and zucchini is charred but still firm. Let cool slightly. 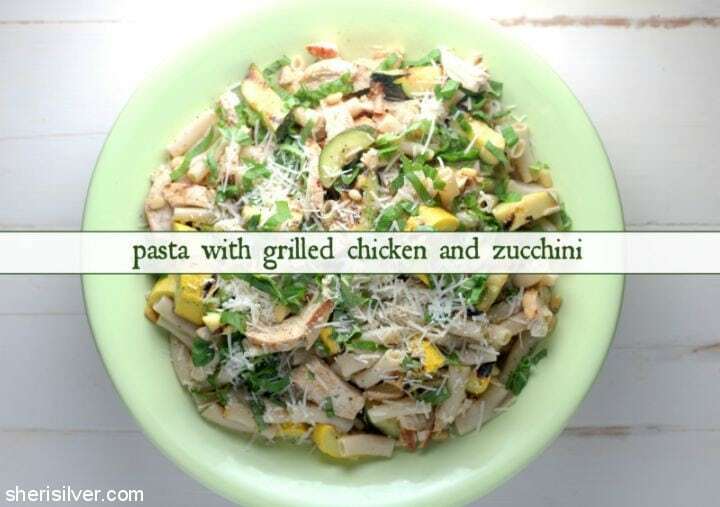 While chicken and zucchini are cooling cook pasta according to package directions. Drain and add to the dressing in the serving bowl; toss lightly. 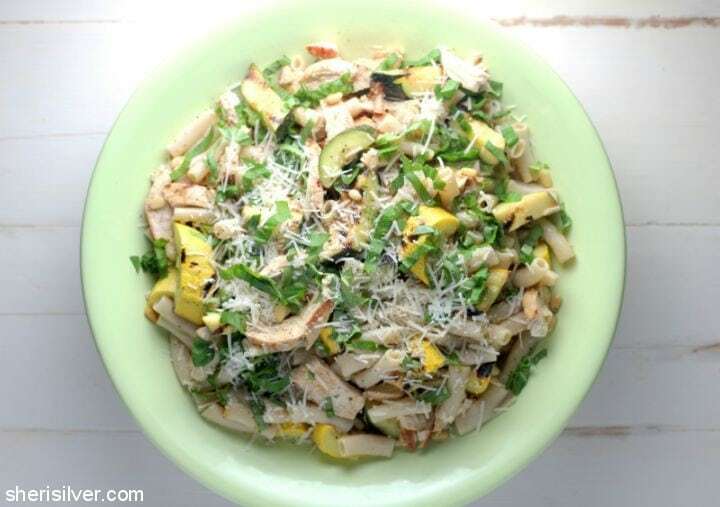 Slice the chicken and zucchini into bite-sized pieces and add to the pasta. Toss to coat and sprinkle with the pine nuts, parmesan and basil. Serve immediately or at room temperature. I need to make this recipe.